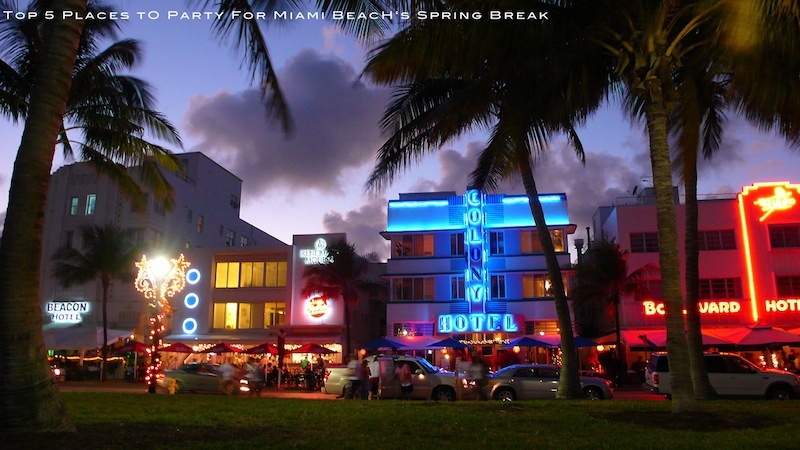 Miami Beach is the nation’s premiere Spring Break destination. The bikinis are out, the beaches are packed, and the masses are looking to celebrate. Urban Party Life has rounded up the Top Five Places to Party all week long. Mansion Nightclub is the South Beach nightlife staple and the biggest name under the Opium Group. It is known to be home to a new celebrity party every week and stands as the king of Washington Avenue. Thursday nights feature the best hip-hop music when The 400 Club hosts “In the Studio with The 400.” Head back to Mansion on Sundays, when their weekend closing party is Miami’s prime Destination. Cameo also lives under the famous Opium Group and is considered the sister-club to Mansion. After a recent revamp in sound and decor, Cameo offers an authentic club vibe in a slightly smaller setting. For this Friday, March 11th, Cameo will be home to “We Rock Hip-Hop” with special guest host DJ Khaled. The 400 Club also takes residency at Cameo on Saturdays, offering party goers a taste of an upscale urban experience. Dream Nightclub is home to Miami Beach’s only true Wednesday night party. The venue features two floors of dance space with three uniquely themed rooms. This Wednesday, March 9th, “Fantasy Wednesdays” will feature a party hosted by L.A. Laker Ron Artest. Artest will be joined by DJ Affect, Sam Sneak, and DJ Knowledge, and will also be performing his new single. Dream’s “Eye Candy Saturdays” stays true to its name by bringing out the hottest crowd in Miami Beach. DJ E-Feezy and DJ Knowledge will keep the music going to wee hours. Club Play is considered a Miami Beach urban nightlife staple. It has been home to some the biggest parties on the beach with celebrities and athletes dropping in regularly. On Wednesday, March 9th, Play will welcomes Uncle Luke. The infamous Miami icon will host “Freaknik Miami.” Come the weekend, “Play Fridays” will be hosted the beautiful Rosa Acosta and Def Jam artist, Ace Hood. The March 11th event will feature music by DJ Stevie J and Top Feelin. Located inside the renovated Fountainebleau Hotel, LIV offers three full-service bars, a large main room, and two stories of party space. LIV has become famous for its exclusive events and unique VIP sky boxes. Its “Imagine Sundays” soiree has gained the reputation of being the biggest and best way to close out the weekend. The March 13th, Spring Break Edition will feature a special guest set by DJ Camilo, as well as sounds by Don P and Stevie J.